Kiinteistömaailma, eCraft and WhereOS implemented together an analysis of house price development in six largest cities in Finland. The raw data produced by Kiinteistömaailma was analyzed with eCraft Property Valuator-tool, and visualized into a heatmap video using WhereOS. House price development in the capital area of Finland (see videos for other 5 largest cities below). Green = +5% yearly price increase, Red = -5% yearly price decrease. The price development videos clearly show, how the prices dropped during years 2008 and 2009 due to the world wide financial crisis, but after that the price development has been steady and positive. Regional development in the capital area, but also in smaller cities has varied a lot: the city centers usually show as green (price has increased), whereas red areas appear mostly further away from the city centers. “The heatmap animation produced by eCraft and WhereOS shows in an interesting way how real estate prices have development during the last decade in the largest cities of Finland. It shows clearly how price levels change in different cycles not only between large cities, but also in different areas within the cities”, says Taina Mustamo from Kiinteistömaailma. eCraft Property Valuator is a software/data/artificial intelligence as a service, which offers the best estimates and predictions for real estate price development in Finland. “eCraft’s Property Valuator is a unique model, and an excellent tool for calculating hyperlocal price indexes.”, says Jussi-Pekka Partanen from WhereOS. 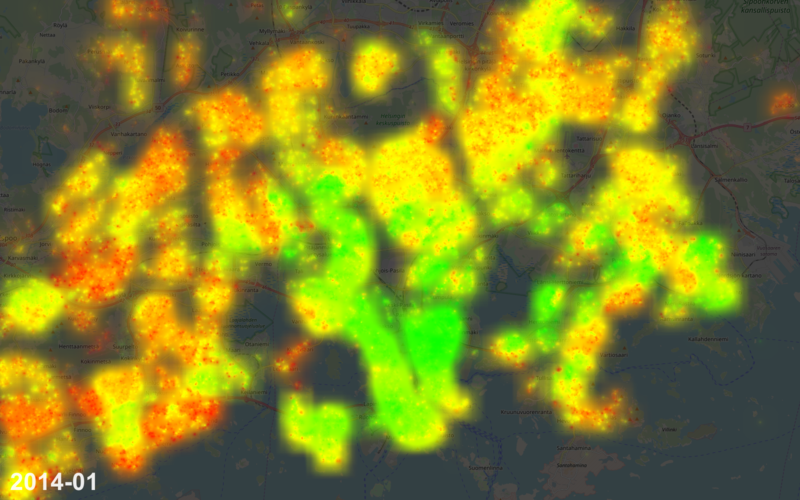 The data from eCraft Property Valuator was visualized using WhereOS heatmap rendering function. The heatmap was calculated by dividing Finland into very accurate grid and calculating the average house price for each of the grid cells for each year and month. This is an app, through which you can visualize demographic data from Finland. Try also clicking for example “Relative” and “Higher level university degree”, or “Employed”. The data used in this visualization: Paavo – Open data by postal code area, Statistics Finland. The material was downloaded from Statistics Finland’s interface service with the licence CC BY 4.0. Check this article how to embed a WhereOS app to your own website. If you have ideas what kind of data you’d like to see in the apps, write me an email support@eaglepeaks.com.